However, it also meant that I had to do something about charging it at home. Locally there are quite a few public chargers and they’re easy to find with PlugShare, but ideally it would be better to charge at home. I could use the supplied 120V / 10A charger, but that would mean a full charge from empty would take a day and a half, and that probably wouldn’t be the most convenient (although my friend Burt does do that with his Leaf). I should clarify things a bit here, it’s not really a charger, the charger itself is built into the car, an EVSE (electric vehicle supply equipment) just tells the car how much electricity it can pull, and has a couple of safety checks to cut power unless it’s plugged in, this means than an EVSE isn’t really that complicated. 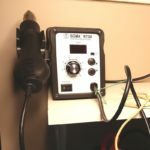 My garage is already wired for 240V and has a nice 30A / 240V outlet (NEMA 14-30R aka a dryer outlet for those that care about part numbers) for a welder so the only real task was to source a 24A (80% continuous load on a circuit) level 2 EVSE. Oddly it’s an unusual value, 16A and 32A (for 20 & 40A circuits) are common, but the in between wasn’t quite so easy. There are a few commercial ones out there, but they’re really quite a lot more money than the 16A ones, and what the heck, building one is more fun. Another departure about doing this project is that I filmed the whole thing, and placed it on youtube. This was a new endeavour for me, and took a lot of fiddling, camera work, microphones, and video editing that I hadn’t touched before. I think it turned out OK, and I’m eagerly awaiting what people have to say. 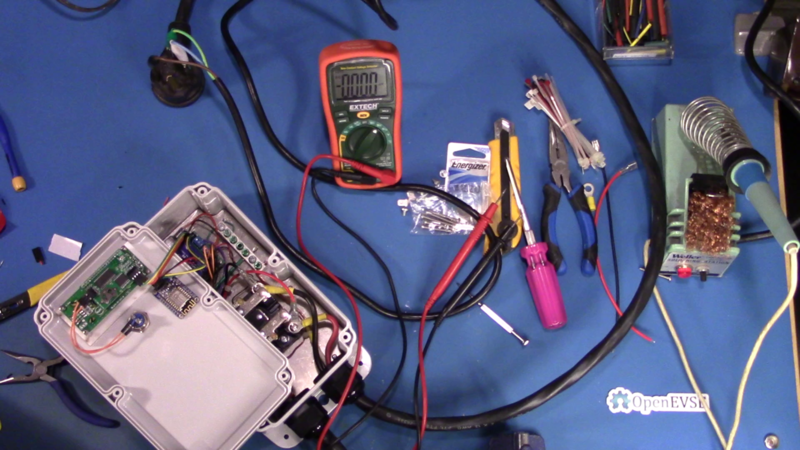 The EVSE works well, and the only real issues with the assembly are that the instructions are not super obvious, and that there are two wires that they join in a silly silly way (using a 2 pin header), so you don’t have to solder it. I just soldered it. 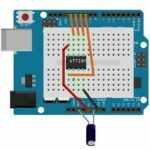 There are a lot of tutorials on the net on how to do this, but nowhere is there a single, simple concise list of how to hook it up, and how to actually program a raw chip using the Arduino eco-system; so here we go. 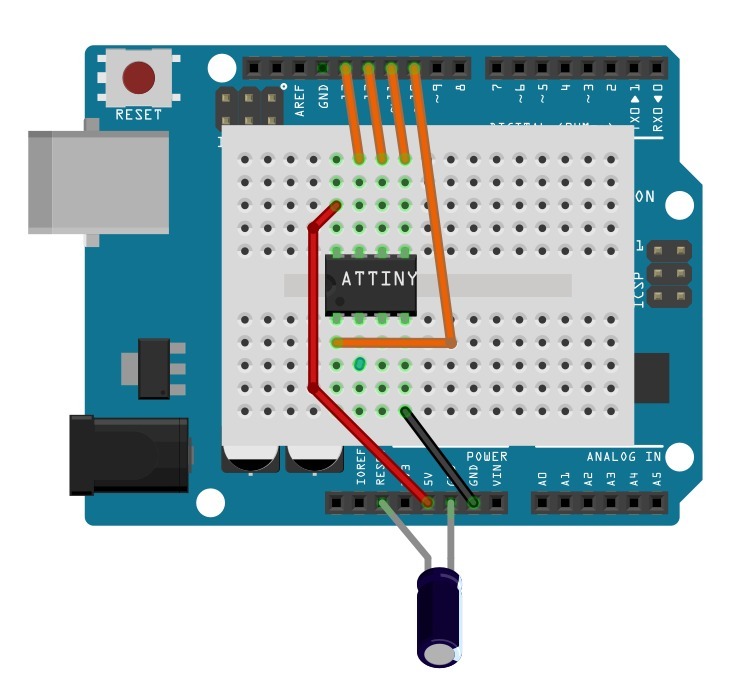 Program your UNO (or other Arduino) to be an In System Programmer (ISP) to program bare chips. 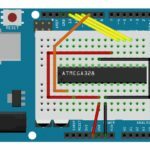 This is just like programming any other Arduino sketch. Now you need to add the definitions for the ATTiny/ATMega chips. The development environment doesn’t come with them, so you have to add them manually. 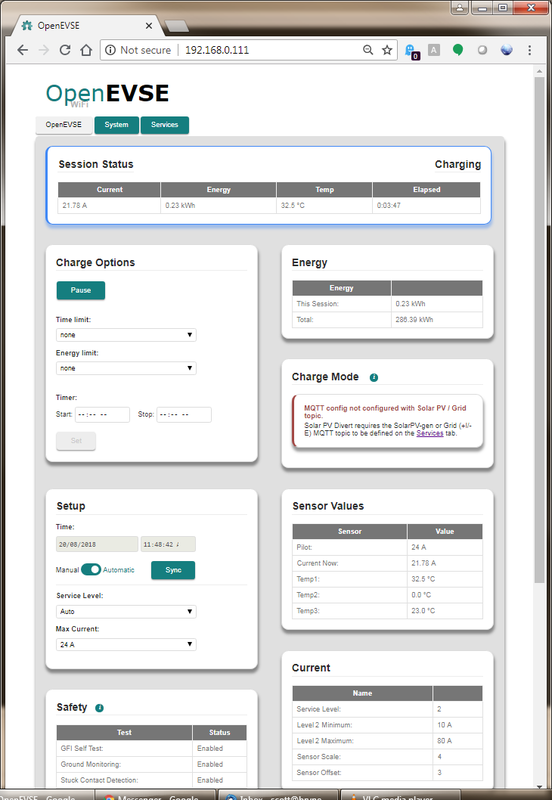 When you’re programming the CPUs directly, there are more settings than just for an Arduino. Things like clock, clock internal/external etc. These settings are stored on an AT processor in what is referred to as “the fuses”. Write Code, just like you would before. 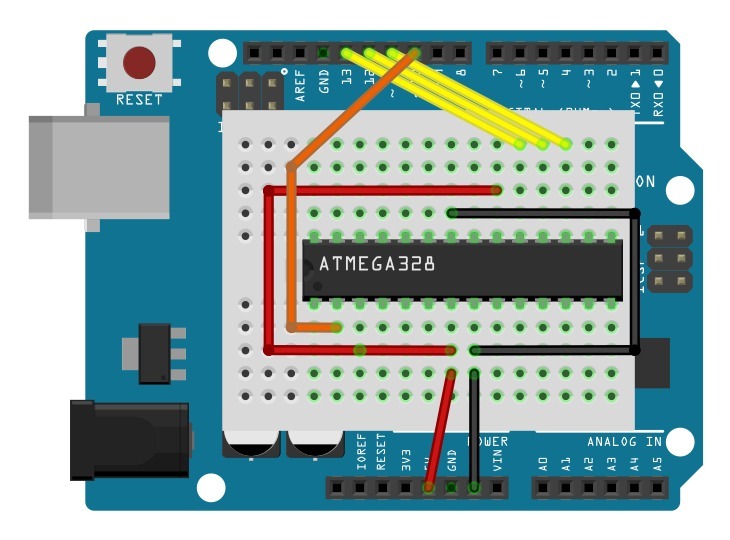 That last step is the one that’s easy to get stuck on, and just hitting upload doesn’t work (on the ATMega), because it assumes it’s an Arduino, you have to say “Upload Using Programmer”. Lastly, you’ll need some diagrams of how exactly you hook it all up, so here it is. That capacitor on the ATTiny layout is 10uF between Reset and Ground. So many things going on, and I’ve been very bad not writing anything in the blog; so here’s a little update on something I’ve started. 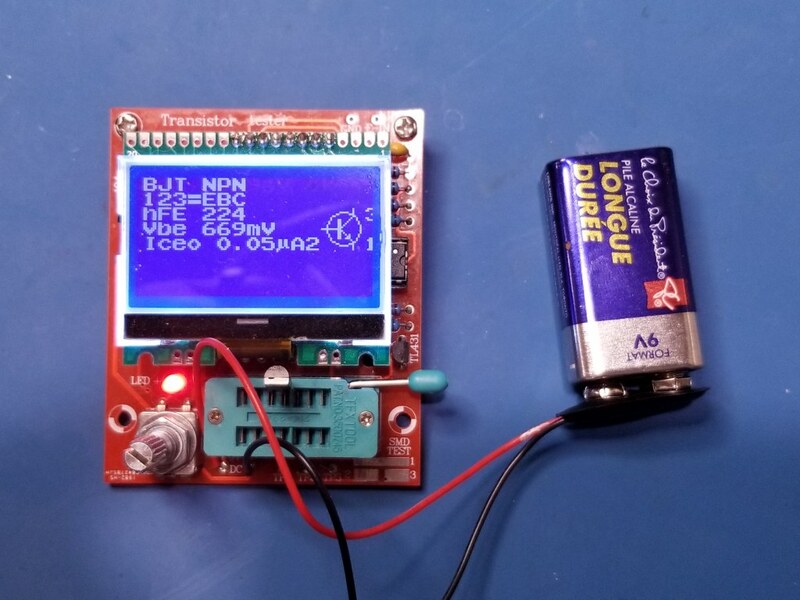 I picked up one of those inexpensive ATMega-based component testers off AliExpress. It’s a really really neat idea, and works remarkably well for something that’s only $12. Drop in a component and out pops value(s), pinouts etc. There’s a huge thread on eevblog about them, and Dave even did a video of a another variant, so it was time to play around. This version I picked up has a a bunch of other options such as a basic frequency generator, but I was really just interested in the basic component identification, and a simple LCR meter. to your path. Picking all of the various options for my specific version (type of display, encoder etc) was a some reverse engineering, and trial and error, but I’ve succeeded in being able to reprogram an ATMEGA328 (and not the P version, because I was stupid on my last Digikey order) to burn the firmware. At least I have a starting point. But what I really thought might be fun would be to make a standalone one that could spit data back to my PC, so I hunted online for one of the many circuit diagrams for these testers, and then composed my own version, that speaks serial (I know, how old fashioned). A little work in KiCAD and then fire off the result to OSHPark for some boards (I do love OSHPark). The result is this. I still have a long way to go, because a busy Christmas period has really put this on hold, but I hope to get back to this project really soon. Over the next month or two (or likely 4) I’m going to try and hack the hardware into having a ‘serial’ display. From my gaze at the one major variant of the code, different displays are handled as separate modules, so I’ll probably have it just output keyvalue pairs, or something like that. 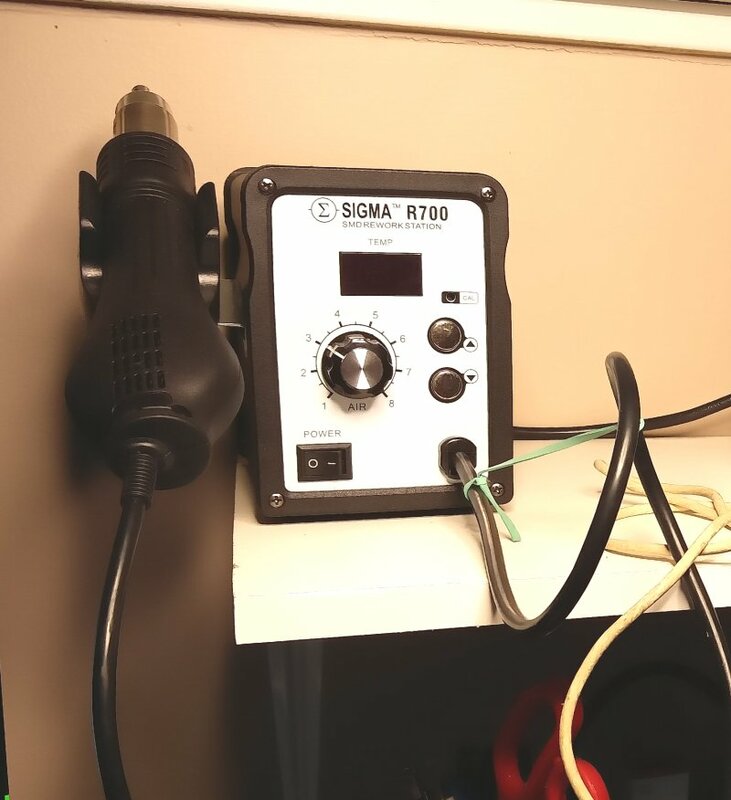 Well, I bit the bullet and decided I really needed to learn how to do surface mount, so I went and bought this Sigma R700 Hot Air rework station from Amazon. L ooks to be an exact clone/rebrand of the really popular 858D, but for C$75, it seemed like a deal. Now that I’ve got it, it seems to do what it’s supposed to do, and lacking any comparative tools to try it against, I’ll call it great. 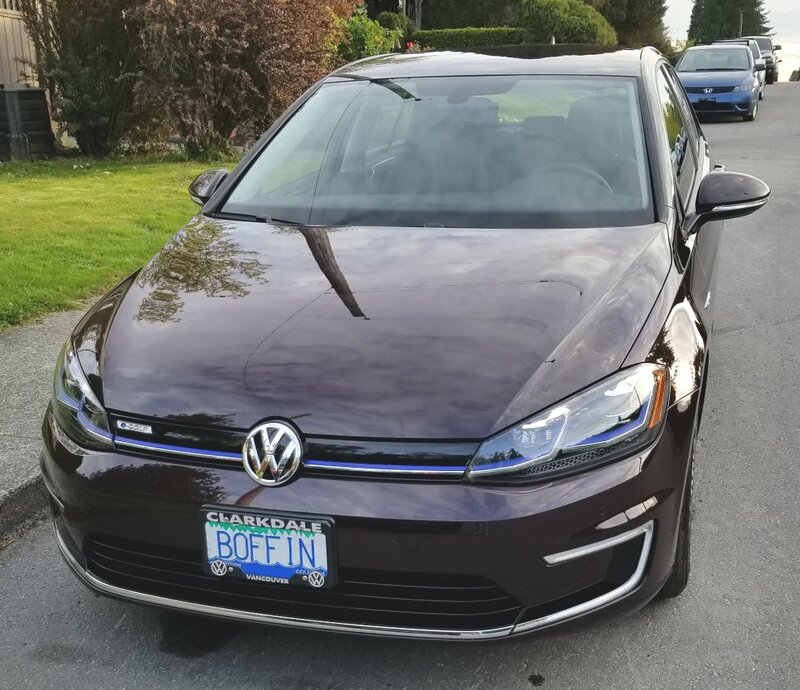 Weirdly after buying it, a whole bunch of fraud-sellers appeared on amazon.ca selling it for $25, but then they all disappeared, and now all I see is the 858 for similar money. 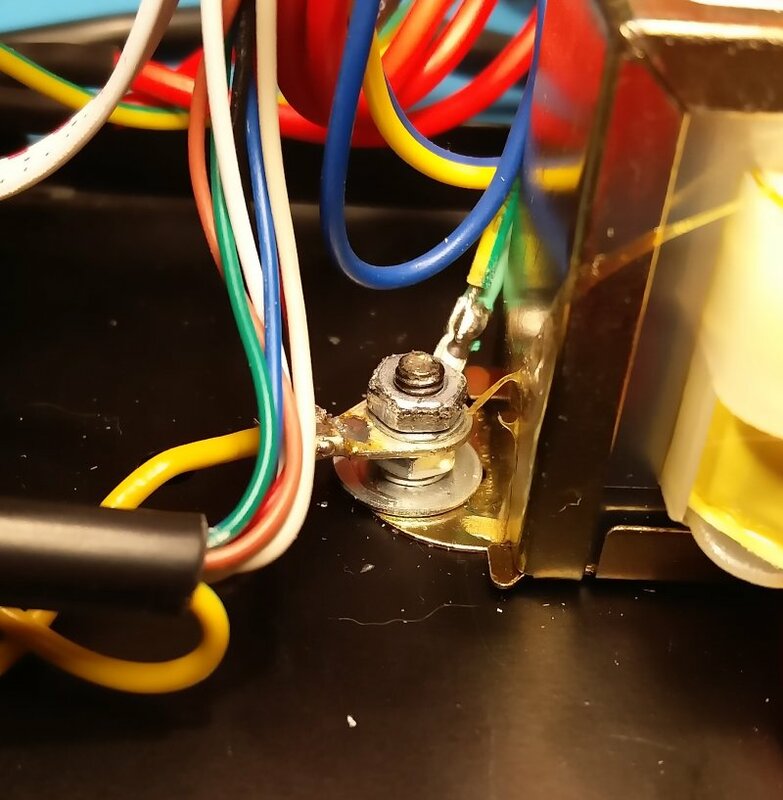 I have seen a couple of warnings about poor grounding, and I thought while I was writing this I should probably should take it apart to check, so I changed the ground routing for the nozzle straight through to the ground lug on the transformer. 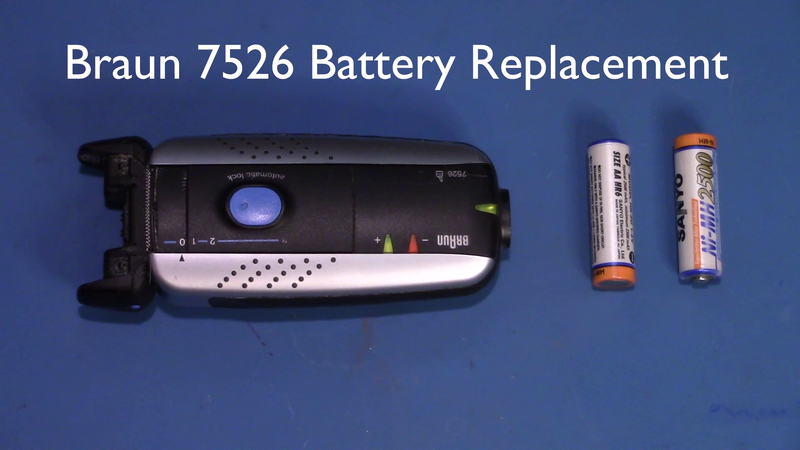 Dave did a review of a very similar (but has a different PCB to mine) 858D version, which is worth watching. Anyway, onto actually using it…. Of course this all meant that I started to run out of room on my desk, so I built a little shelf to put my soldering equipment and PSU on, and it leaves more room for the meters and what I’m working on further down. Amazing how one thing always seems to lead to another. 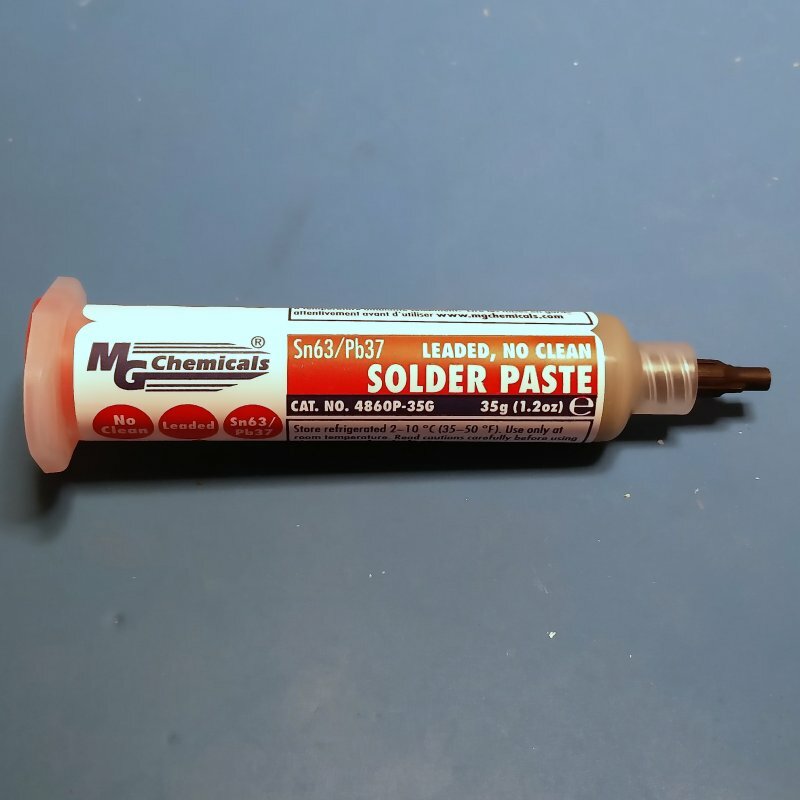 Anyway, onto soldering, but of course I needed some solder paste, so a quick Amazon prime (ordered at 10:30 one night, delivered the next day) for some MG Chemicals solder paste (really not worth skimping on some off-brand with solder), and I got to work. 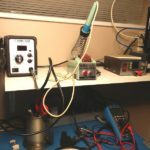 I had watched a bunch of various videos, but developed my own system of small blobs of solder paste, and then hitting it up with the hot air gun. 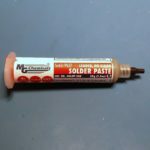 I keep the solder paste in the fridge (apparently it will last longer), but didn’t really give it enough time to fully warm up, it is a little easier to work with when it’s room temperature. Below are a couple of photos of my handywork, and it’s actually quite a bit easier than I ever expected. 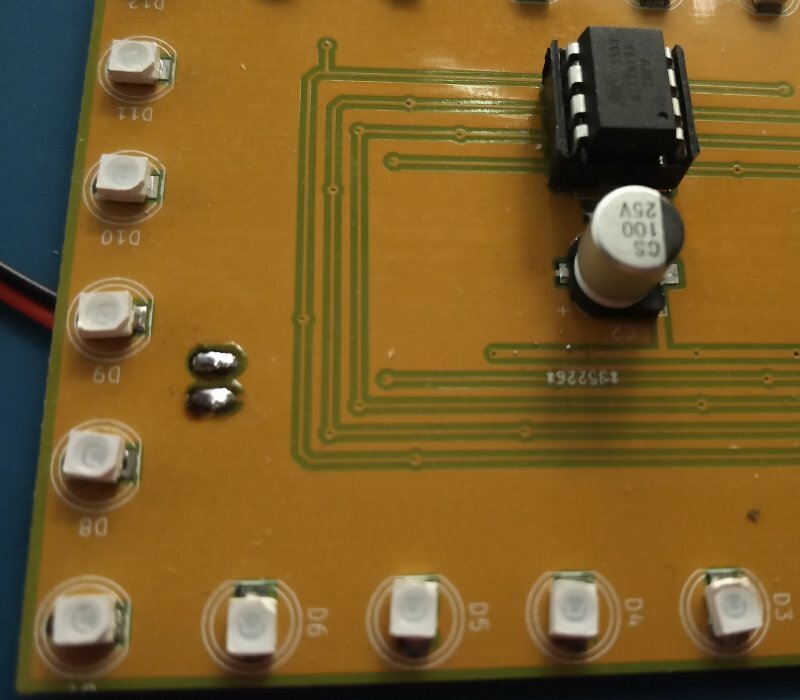 By trial and error I discovered that I need a little less solder paste than expected, and by waving the magic wand (hot air blower) over the board for a few seconds it all nicely melted into place. 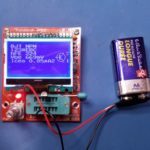 I was working with 0805 resistors, and sot23 FETs so I suppose things could be more difficult, and I noticed this kit on Tindie for those really inclined to try and punish themselves. In the end I think it all turned out pretty well. The components are soldered into place, and it doesn’t look like too much of a botch job. On the top side for fun I decided I’d try puting some SMT LEDs in the place of where the through-holes would have gone. You end up using a little more solder than normal as some goes down into the hole, but it also seemed to work pretty well (although I did get a couple of LEDs in backwards the first time.. That’s pretty easy to mess up). The observant people out there will also notice I missed two traces on my PCB, I’ll let you try and locate the jumpers. 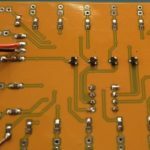 I’ve been meaning to make a more permanent power supply board for the nixie project, so over the last couple of weeks I decided on what I wanted. 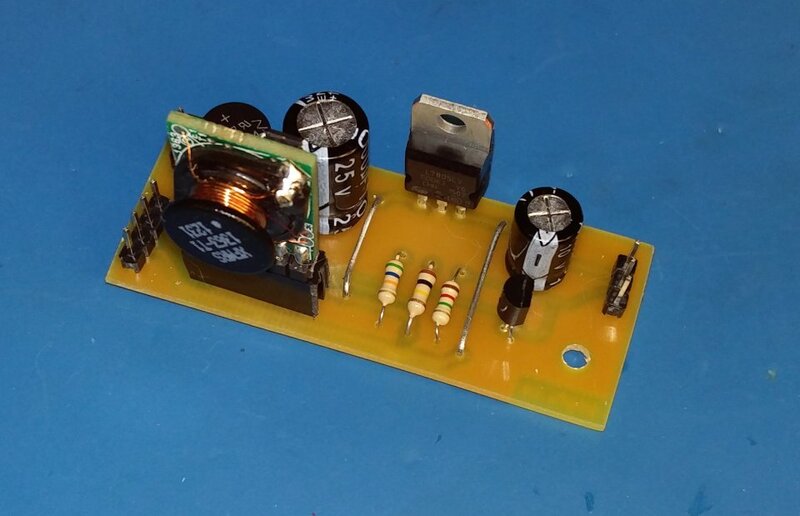 Transformer input, which meant a bridge rectifier, couple of caps, the mount for the DC-DC power supply from tayloredge, a regulator to drive a 5v ATtiny later on, along with a FET to turn on and off the high-voltage output. 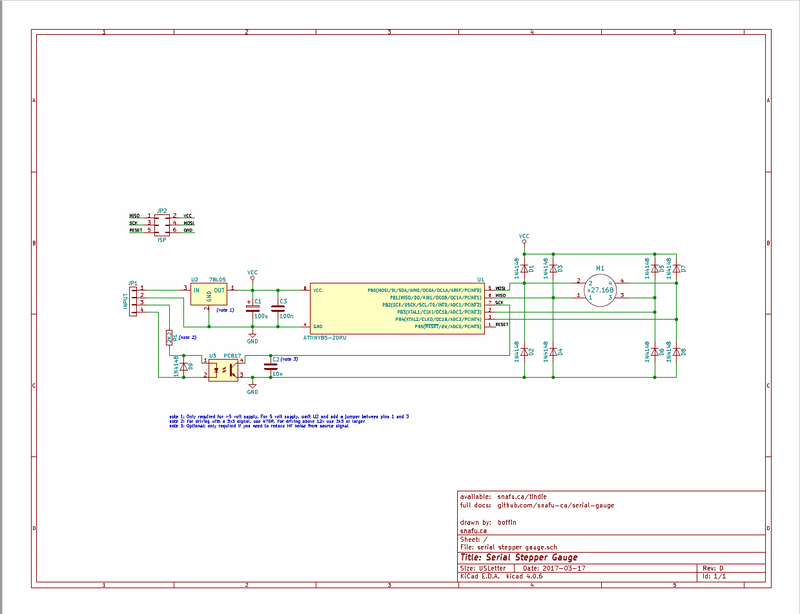 So I plunked it all into KiCAD (I’m getting better at it), and this is what I came up with. 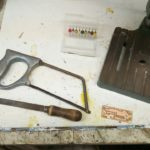 I also decided, I’d try my hand at etching it myself, and take advantage that Misses Boffin had recently purchased a heat press. Maybe I’d be able to do better heat transfers from my Brother laser printer — which are notoriously bad for toner transfer due to a higher temperature toner and fuser than most others (like HP). Well, I played with all sorts of backing, all sorts of temps and time, and came up with pretty much what I had done in the past; old glossy magazine paper. The glossy magazine paper, along with about a minute at 375°F in the heat press gave a pretty good results. After a 10 minute soak in water to pull the paper off, it turned out pretty well. In fact very well, I’ll probably do a lot more this way now that I have a reliable transfer method. Also, I made sure to ground fill the board, so I’ll use less ferric chloride in the future (not that it’s that expensive). On to etching; I use two pyrix dishes, a larger and a smaller one. Put some hot water (just off the boil in the outer), and then ferric chloride in my inner pyrex dish, (silly me didn’t take a photo), and it took about 6-7 minutes to etch. The moment of truth, rub off the toner (I use a stainless steel dish scrubber to pre-clean and post-clean the board) and what does it look like; it looks great! 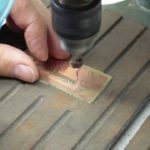 Drilling is a breeze, I bought this tiny drill press from Rio Grande a few years back, and it does a great job on PCBs. 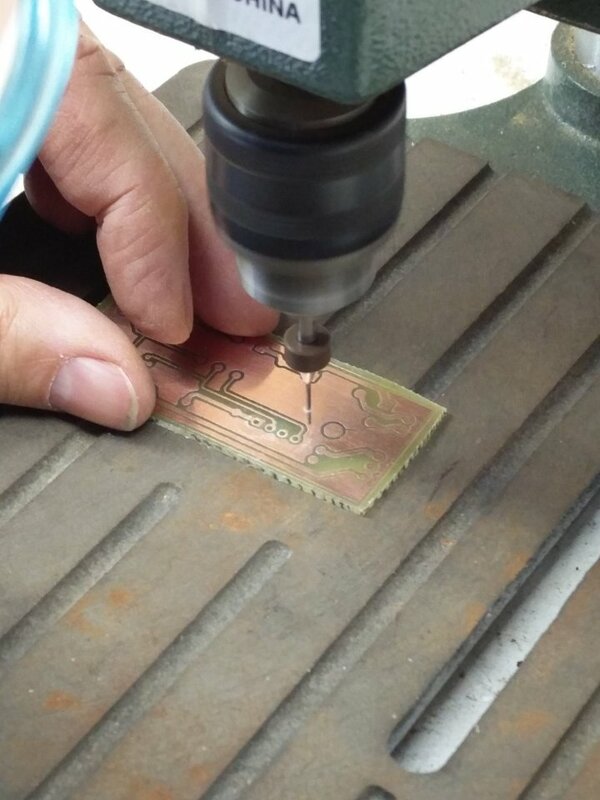 It has pathetic torque, but when you’re drilling a 0.9mm hole, you don’t need it. With my aging eyesight, I tried using the optivisor to get a better look while drilling, but in this case it doesn’t work that well, as you have to get insanely close to get anything in focus, so I ended up just doing most of it using the bad eyeball method. A few test fits along the way, and it was definitely in the realm of ‘close enough’. Finishing the board I realized I was using the same saw and the same file that I would use to finish veroboard projects from nearly 40 years ago. 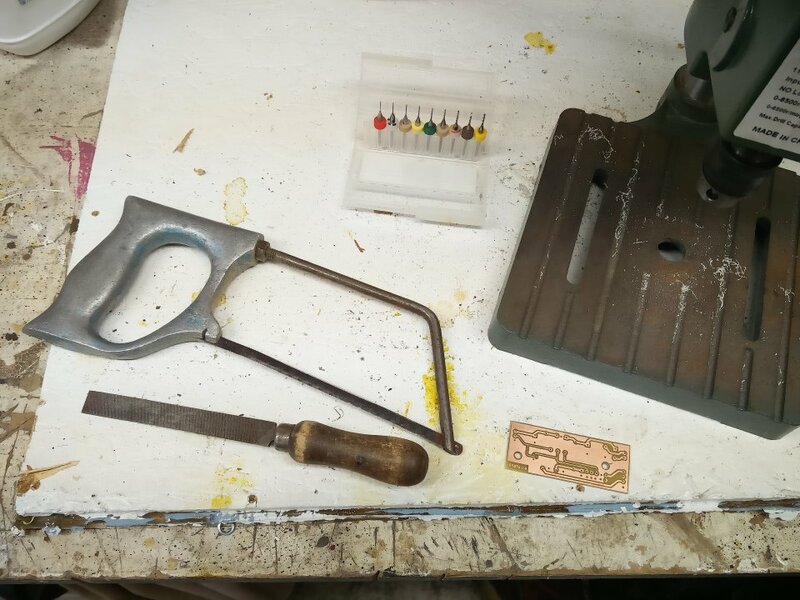 The saw is an engineering metalwork project from my O-level days (Tin-Man will likely recognize it), and the file was inherited from my grandfather’s stash of tools in the mid-70s. The final result turned out really well. I managed to not get any pin-outs wrong, the regulator is perfectly at the edge of the board to allow it to mount to the back panel for heatsinking, and most importantly it worked first time. Just need to get a 12V transformer from Lee’s at some point, and fit all of it (transformer, PSU board) along with a switch and fuse and I’ve got the supply all done for my mystery nixie project. I also spent some time over the weekend playing on another project, but that will be another post, when the last of the parts for that arrives. Well, the first of two orders of PCBs came back just before I went away on vacation. 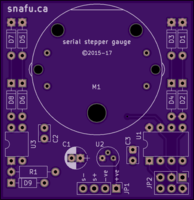 The first lot I had discussed in my previous blog entry, and was a remake of my stepper gauge project that I sell on Tindie. As my previous experience with OSHPARK, the service is superb. 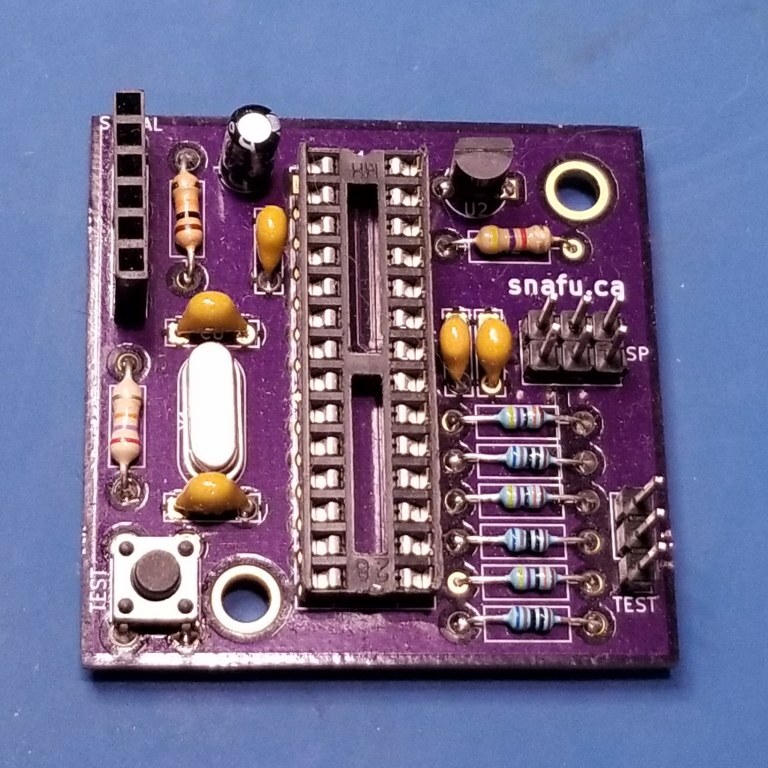 About a 18 day turnaround including crossing the border, free shipping to Canada (not many include that), plus a nice “PERFECT PURPLE PCBS” sticker, which I’ve adorned to my electronics toolbox. 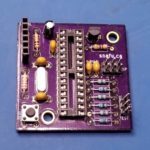 If you need a quick(ish) PCB service for a prototype, OSHPARK is pretty close to perfect. Apparently I did my homework well, because the X27.168 stepper package outline (I found one on the net, but tweaked it further) fits like a glove, unlike my previous revision where I had relied on someone else’s package file and every board required some drilling to fix layout holes. It all looks very nice, and I love the purple, but sadly I didn’t get a chance to assemble one before I left on 3 weeks holiday, all I managed to do is file off the mouse-bites that they used to panelize it. 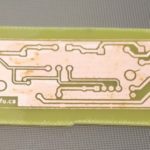 Once I had become familiar with KiCad, there was no stopping me, so I had also slapped together a little hybrid surface-mount/through-hole project that I’ll use for an electronics class I’ll be teaching in the near future, and ordered them from a company I had read about on EEVBLOG called DIRTYPCBS. When I return, I’m hoping my other PCBs will be sitting waiting for me. 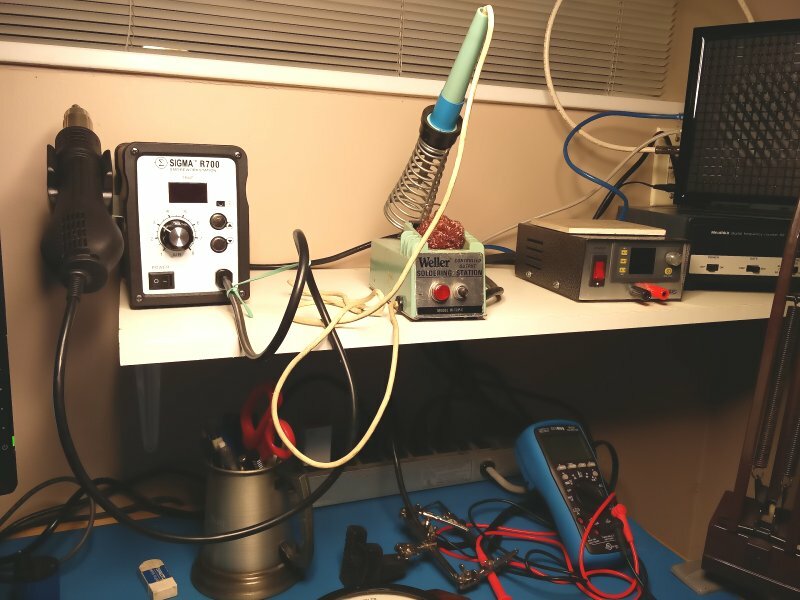 I read about this service on EEVBLOG, and it has a few advantages over OSHPARK. Firstly the price; as they’re in Asia (Hong Kong), the price is amazing (US$24 incl shipping for 10 boards 10cm x 5cm). 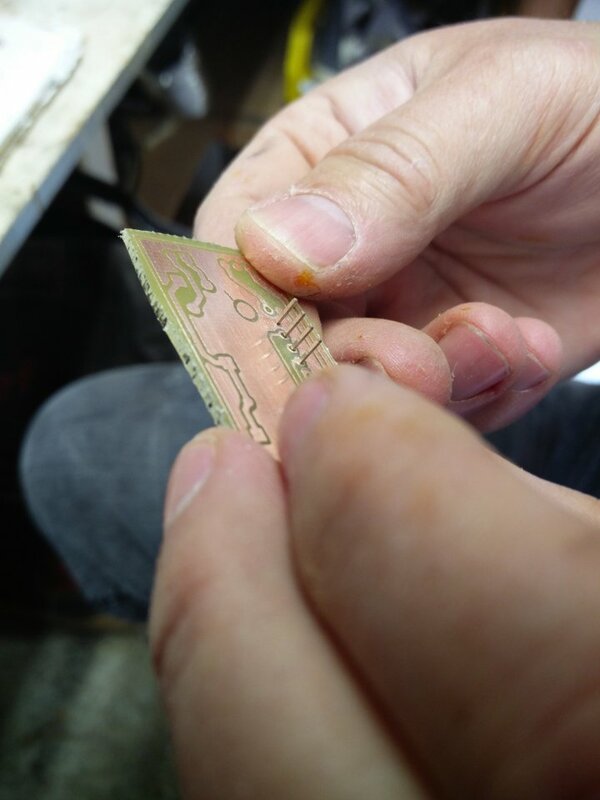 Secondly you have a lot more options such as PCB thickness, soldermask colour, etc etc. I’m quite excited that DIRTYPCBs might become my go-to circuit board provider for anything more than a couple of small samples. Also this board will be my first real foray into SMD (just some 0805s, SOT23 and small LEDs). 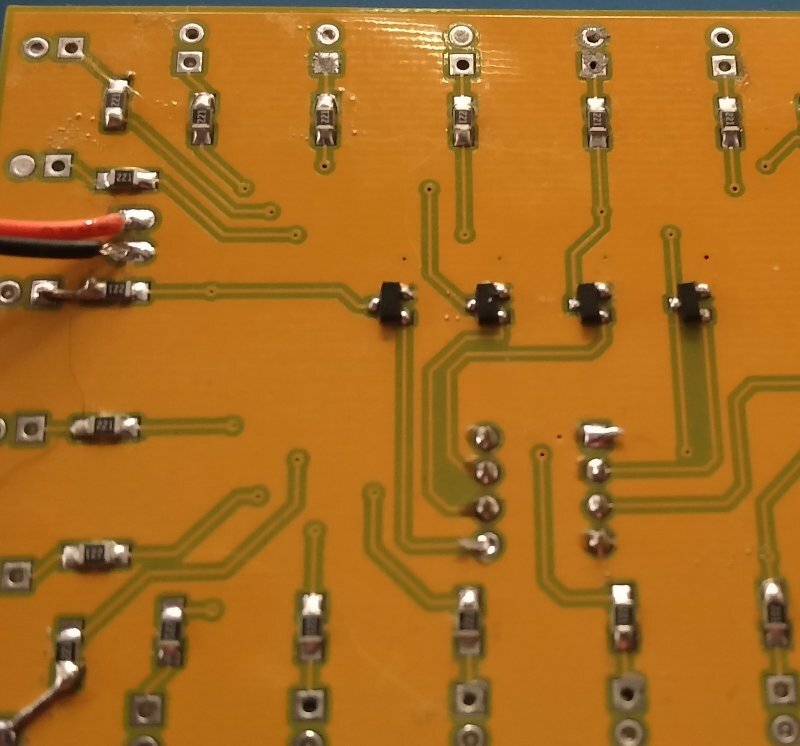 I’ve avoided SMD as I lack the tools (and eyesight), but wow are the parts ever cheap, one dollar will buy you 300 resistors, or 100 capacitors, or 100 FETs; just incredible. I’ll still try assembling with the old weller iron, but I’m curious to try paste and and a hot air gun. 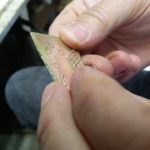 Also, I did some reading (and viewing on YouTube) of people doing hybrid hot/cold transfer for laser printer transfers. I have made single sided PCBs using the laser printer transfer method and an iron, but it took a fair bit of experimenting to discover that with my brother laser printer that only glossy magazine paper really worked for laser printer transfers. Two things have changed; one I discovered people are using a mixture of acetone/isopropyl alcohol on the PCB surface prior to transfer to slightly disolve the toner, and secondly Misses Boffin has purchased a heat press (for doing vinyl transfer), so I have a better heat press with likely more even heating/pressure. Hmm, I wonder if I can just cut a PCB mask using a silhouette vinyl cutter. Must look into that, that might work too. 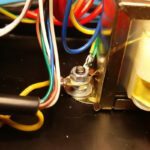 Something I’ve been putting off for a while… Switching EDA. I’ve always mucked around using Eagle for my personal stuff (and even for the stepper board I have on Tindie – bad me), but recently Eagle was bought by AutoDesk, and that doesn’t bode well for its future for being free for a hobbyist. 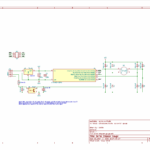 Time for a new CAD package, so what to use? 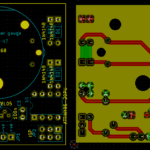 Well, that decision is pretty easy, KiCad, an open-source Electronics Schematic/Layout package which does everything I’m going to need (and likely a lot I’m not going to need). It’s a big do wnload, there’s a lot to it, a big program, extensive libraries on GitHub, all in it takes over a GB on disk, but it appears to be worth it. Now where to get started; and as with so many things these days, that’s YouTube. 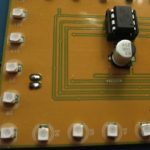 Contextual Electronics have a set of videos, including a KiCad beginners walk through, so after a few of those I decided it was time to take my old serial stepper gauge, and completely re-do it in KiCad. Not sure why I make these decisions at midnight, but I did, and although it took a few hours, I have this all figured out. I managed to fix a bunch of things like the hole layouts on the old one, and made sure it’s hooked up/pinned out the same way as the old board so no changes required in software. The next day, when I was completely satisfied with the layout, I added flood fills (which I didn’t have before), some supporting text, checked the holes again for alignment and patted myself on the back. Now on to order some purple boards. Most people know what that means, for those that don’t let me introduce you to OSHPARK. 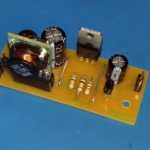 3 boards @ $5/sq in, shipped, including free shipping to Canada. Just over fifteen dollars, an almost impossible to beat service for this kind of prototyping. 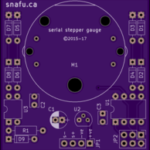 OSHPark is such a great service, and with KiCad (and other software packages which shall remain nameless from now on), you don’t even have to produce gerbers, you just upload the .kicad_pcb file. Well, they’re ordered, and hopefully in about 10 days I’ll have ready to test boards; and I’ll post another update then.